It was a good Friday of PBA basketball, mainly because nobody got into fisticuffs and nobody was ejected. On the flipside, it also means Friday was relatively uneventful, though the Bolts did have a nice bounce-back win after getting the rug pulled from under them this past Wednesday and the Mixers likewise came out strong after the humiliation they got from TNT in their last game. 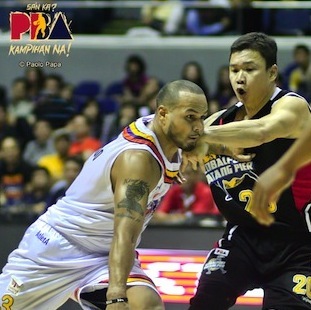 Sol Mercado is #2 in the PBA Player Efficiency Top 10. What’s very interesting, of course, is that the team on top of the standings, Talk N Text, has only one player on this list – Jayson Castro. And he’s number ten to boot! That’s probably a testament to the balance and depth of that squad. Another interesting thing is that two of the top three guys, Arwind Santos and Chris Lutz, are playing for Petron, which has been struggling to find consistency in this conference. At 5 wins and 6 loses, the Boosters are currently tied for sixth spot with the Alaska Aces, who also have two guys on this list – Calvin Abueva and Cyrus Baguio. I’m really happy about Enrico Villanueva. 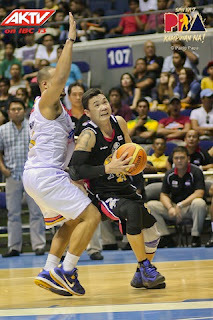 The Raging Bull seems to have finally found his niche with the Barako Bull Energy Colas. He’s definitely playing a bigger role for them than he’s ever played for any other team before. 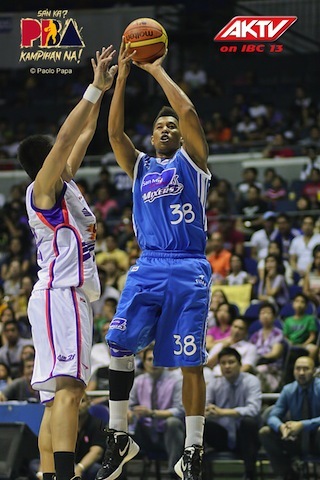 The former King Blue Eagle is averaging career-highs in minutes, points, rebounds, and assists. Curiously, some of the big names NOT on this list include James Yap of San Mig Coffee, Gary David of Global Port, Gabe Norwood of Rain or Shine, Kelly Williams of TNT, and Jimmy Alapag also of TNT. Also, the only rookie on this list is Alaska’s Abueva. Only San Mig Coffee and Air 21 don’t have any players on this list. This time, Sol Mercado made sure to get the job done. Mercado, who finished with 24 points and nine assists, scored the biggest baskets to lead the Meralco Bolts to a 101-92 triumph over the GlobalPort Batang Pier Friday night at the SMART-Araneta Coliseum. The Bolts survived the early onslaught by Gary David, who scored 25 of his 33 points in the first half, and the late brilliance of Rey Guevarra, who scored 18 of his 20 points in the second half. Mac Cardona led the way with 26 points for Meralco, while rookie Kelly Nabong had a career game with 18 points and 11 rebounds. But it was Mercado who drilled in a cold-blooded triple from the left wing to beat the 24-second shot clock and put the Bolts on safer ground, 91-83, with 2:35 left in the game. The spitfire guard then put together six more points to help put the game away for the Bolts, which won for the sixth time in 10 games. Mercado also helped Meralco force overtime against Rain or Shine last Wednesday, but the Bolts succumbed to the Elasto Painters in overtime after holding a 26-point third quarter lead. Meralco made sure there would be a different result against the Batang Pier. “Sol’s game was really so balanced in this game. We just have to make sure to give him enough rest to give us the finishing kick. It’s a very gratifying win after an emotional loss to Rain or Shine,” said Gregorio, who asked his coaching staff to play a more active role in their game against the Batang Pier because he felt he was like he was hit with a “haymaker” coming off a loss to Rain or Shine where his team squandered a 26-point lead. Gregorio also attributed the team’s win to the players’ mentality to play Meralco’s brand of basketball. “Humility was a key factor in our success today. We should know to handle our success. Bully basketball is not part of our vocabulary. 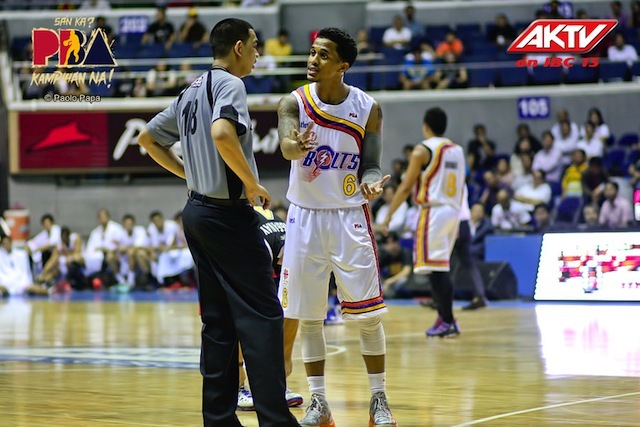 We’re winning games because of our tough defense and solid basketball,” said Gregorio. MER 101 – Cardona 26, Mercado 24, Nabong 18, Buenafe 14, Hugnatan 10, Hodge 2, Ross 2, Borboran 2, Salvacion 2, Reyes 1, Artadi 0. GLO 92 – David 33, Guevarra 20, Manuel 15, Miller 7, Al-Hussaini 5, Mandani 4, Deutchman 3, Vanlandingham 3, Salvador 2, Lingganay 0, Yee 0, Vergara 0, Adducul 0.
to tow Global Port to a win. 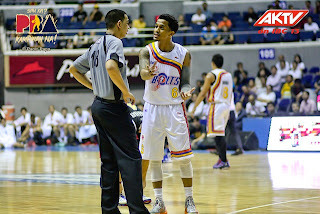 Meralco's Chris Ross tries to clarify something with the referee. The San Mig Coffee Mixers bounced back from an embarrassing loss with a solid win over the Air 21 Express, 89-80, Friday at the SMART-Araneta Coliseum. James Yap scored 16 of his 20 points in the first half, while Mark Barroca added 12 points, five rebounds, and two assists for the Mixers, who were coming off a 29-point loss to Talk ‘N Text last Wednesday. “It’s a good bounce-back game for us. We got embarrassed big time, and we figured it will be difficult to recover from a loss like that. It’s harder for management, fans, and coaches. But a 30-point loss is the same as one-point loss. We were concerned about how we’re going to respond,” said Cone. Up by only six points following KG Canaleta’s basket, 82-76, San Mig Coffee tightened its screws on Air 21 to end the match. No Air 21 player was able to score until Mark Isip hit a garbage basket with only 23.9 seconds to go and San Mig Coffee up by 13 point, 89-76. Jonas Villanueva chipped in 11 points and Rafi Reavis contributed 10 for the Mixers, who forged a tie for second spot with Rain or Shine at 8-3. 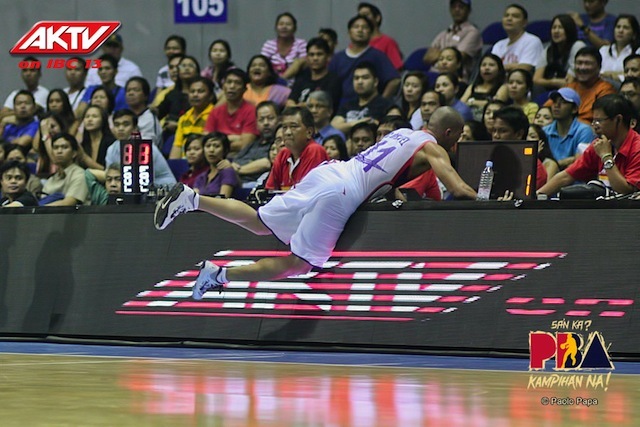 Air 21 suffered its second straight loss and seventh in 11 games. SMC 89 – Yap 20, Barroca 12, Villanueva 11, Reavis 10, Simon 9, Pingris 8, Devance 7, Intal 6, De Ocampo 6, Gonzales 0. A21 80 – Canaleta 18, Sena 10, Isip 10, Cortez 9, Wilson 8, Custodio 8, Reyes 7, Ritualo 6, Baclao 4, Atkins 0, Arboleda 0.
beatdown they got versus TNT this past Wednesday. Mike Cortez dives toward the AKTV coverage team! isn't the player defending devance in the 4th picture james sena?